Branch manager Anthony Metcalfe said: “There is no shortage of excellent agents in Harrogate, so to scoop this award reflects a tremendous team achievement. “Linley & Simpson has a strong focus on customer service which is at the heart of everything we do. The awards were an ideal opportunity to put our approach to the sternest scrutiny from independent mystery shoppers – and they hailed it as ‘outstanding’. The BPA’s Robert McLean said: “Where an agent has been attributed with one of our awards, it is simply down to the fantastic customer service levels that have been demonstrated across a prolonged period of time. The BPA team personally mystery shopped all entrants against a set of 25 criteria in order to get a balanced overview of their customer service levels. Judging criteria is both comprehensive and detailed, exploring different mediums, scenarios and time periods to ensure agents have been rigorously and fairly judged. 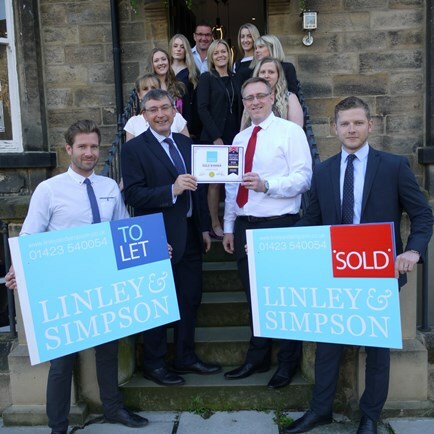 This is the latest in a series of awards won recently by Linley & Simpson, an independent agency with 11 branches across North and West Yorkshire, including Harrogate, Ripon and Wetherby. Previous national accolades have been awarded by judges in the Estate Agency of the Year awards, the Letting Agency of the Year awards, and the ESTAs – the Estate Agent and Letting Agent awards.